This article is about the character named Foreman Spike. For other uses of the name Spike, see Spike (disambiguation). Foreman Spike is the angry foreman of the construction site where Mario and Luigi worked. Rather than help them, Spike continuously tried to hinder the brothers from doing their job, perhaps to rake in the cash for himself. He is a bearded villain who always wears sunglasses, although in Wrecking Crew '98, he did not have a beard. 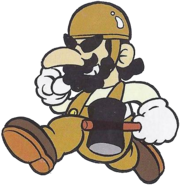 Foreman Spike is said to be a predecessor to Wario and/or Waluigi, much like Pauline was for Princess Peach. Foreman Spike made his debut in the bonus stages where he competes against Mario in collecting Coins. After the first bonus round, Spike will start to appear some phases from the game Wrecking Crew. While Mario runs around in the foreground, Spike runs around in the background trying to outdo the hero. Being already in the background, Spike would not enter doors but he smash them open if Mario is in front of it. While he cannot directly hurt Mario, he will smash down walls, and try to knock Mario off the platform he's standing by hitting objects next to Mario on which could knock him into an enemy or get him in inescapable area. However, Mario can do the same back to him. With a Golden Hammer, Spike can be knocked down without having to break an object next to the Foreman. Like the rest of the enemies in the game, Spike can only be permanently defeated by trapping him, such as dropping an oil drum on him or knocking him into an isolated floor. While there was no picture of him in the manual, his in-game appearance showed the same build as Mario and Luigi, a hooked nose, sunglasses, yellowish brown clothing, a beard, and a mouth full of crooked teeth when struck. He did not appear in VS. Wrecking Crew as his role had been taken over by the second player. In single player, the CPU Luigi will not be damaged by the enemies similar to Foreman spike. Foreman Spike returns in the Japan-only title Wrecking Crew '98. He is the fourth challenger in the puzzle mode game. In this game, Spike is working for Bowser himself, helping the Koopa King build a series of new hideouts. Additionally, Foreman Spike has been redesigned to have a mustache, no beard, a cleft chin, more defined arm muscles, and a red nose, resembling Wario. In the Japan-only Game Boy golf title Mobile Golf, Foreman Spike is an unlockable character. He has reverted to his original Wrecking Crew design and is now overweight. In Super Mario Maker, one of the Mario costumes the player can get from a Mystery Mushroom is Foreman Spike. Besides a slight color difference, the sprite is identical to the original NES Wrecking Crew title. The Japanese Super Smash Bros. Dojo website stated that Mario's brown 3P costume in the Super Smash Bros. series is based on Spike's outfit in the original Wrecking Crew for the Famicom. This color choice for Mario would reappear in Super Smash Bros. Melee, Super Smash Bros. Brawl, and Super Smash Bros. for Nintendo 3DS / Wii U and Super Smash Bros. Ultimate, but becoming more black and white than brown and yellow. Waluigi's Gold Mantis kart in Mario Kart DS resembles the excavator Spike uses in Mobile Golf, while his signature song "Destruction Dance" in Dance Dance Revolution: Mario Mix is a rearrangement of the Wrecking Crew bonus stage music. This page was last edited on February 23, 2019, at 22:04.